Butterfly top of the line Centrefold 25 has been redesigned. 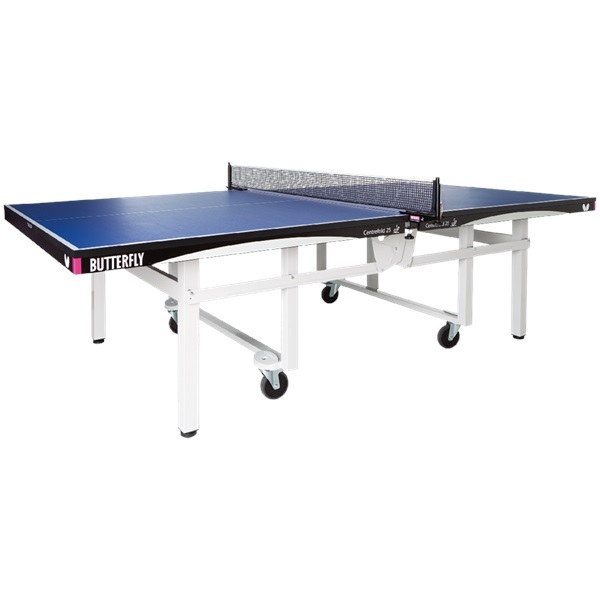 The official table of the 2001-2011 U.S. Open and U.S. National Championships. These preassembled tables are a one piece, fold and roll, design that are perfect for those with minimal storage space and easy enough for one person to maneuver. The new legs are placed 400mm inward which complies with the ITTC ruling for wheelchair competitors. Blue one inch scratch-proof top surrounded by a hard PVC band and strong two inch steel rim. Steel frame with adjustable feet for leveling the table. Includes Europa Net Set. ITTF approved. This table includes a three year warranty against factory defective merchandise.